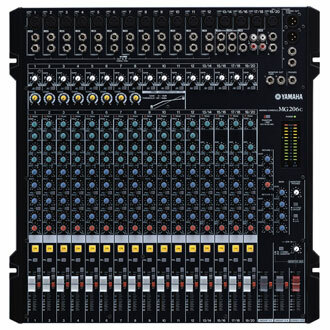 Whether you have a mixing applications that involves only a few channels, or up to 32 inputs with substantial signal routing versatility, Yamaha's MG-series offers a console that will give you the capacity, control, and performance you deserve. All models are remarkably compact and lightweight for superior handling and portability, but absolutely no compromises have been made in terms of features, performance, or durability. The MG mixers offer an extraordinary blend of technology: some inherited from professional Yamaha mixing consoles you're likely to see in distinguished halls throughout the world, and some developed specifically to deliver optimum performance in the MG-console format. In either case these performance-packed mixers are founded on a world-spanning network of human and technological resources that crystallize to deliver features that really matter, and sound that is undeniably superior. Designing a lightweight mixer is not too difficult, but designing a lightweight, compact mixer that delivers serious performance is another matter. The Yamaha design team went to extraordinary lengths in the MG series, including in-depth material and structural analysis, to bring you maximum manageability and maximum performance in the same packages. The result is that you can easily pop the smallest models into your briefcase or shoulder bag and take with you anywhere. Even the larger models can be tucked under an arm and carried around quite easily. But the performance you'll get at the studio, club, hall, or anywhere you choose to use these fine mixers is far from lightweight. Every one of the MG series mixers provides significant space savings along with huge performance benefits. Top-mounted input and output connectors make setting up and re-patching your system quick and easy. All models feature high-quality Neutrik™ balanced XLR connectors on mono microphone/line channels and XLR-equipped stereo channels. These professional-class connectors were subjected to extensive testing by the Yamaha design team, and were chosen for the MG mixers for their superior reliability and sonic qualities. The XLR-equipped stereo channels can accept mono microphone input either via the XLR or phone jack connectors. The remaining stereo channels provide phone jack and pin jack connectors for compatibility with a wide range of sources. Mono input channels also feature insert I/O connectors that let you patch external signal processing gear into those channels as required. Separate pin jack 2TR inputs are provided to accept the output from a CD player or similar stereo source. This advanced feature can be a tremendous advantage in achieving great vocal sound, as well as to refine the sound of bass, guitar, and other sources. You won't find built-in channel compression on too many other mixers in this class, but in the new MG mixers you have Yamaha's innovative one-knob compression feature on several of the mono input channels. Conventional audio compressors with their threshold, ratio, knee, makeup gain and other controls can be complex and time consuming to set appropriately for a given source. Yamaha's one-knob compressor eliminates the need for an engineering degree with a single control that lets you simply dial in the amount of compression you want. Microphone preamplifiers are critical in any mixer, and a performance bottleneck in many. That's why pros often spend thousands of dollars on just a single channel of microphone pre-amplification. The microphone preamps built into the MG mixers inherit technology from Yamaha's top-line professional consoles, and have been painstakingly designed to deliver superior sonic performance with any dynamic or condenser microphone. Gain trim covers a wide - 60dB ~ -16dB range for microphones (-34dB ~ +10dB for line input), so you'll be able to achieve optimum level matching with just about any source. All microphone preamps also feature switchable phantom power so you can take advantage of the natural, extended response of high-quality condenser microphones. Building a truly useful, musical-sounding channel equalizer is no easy task, but Yamaha has decades of experience in building pro consoles to draw on. You reap the benefits in the MG series mixers: all mono channels feature 3-band equalizers with LOW, MID, and HIGH controls. Depending on the model some of all of the stereo channels have 2-band EQ for smooth equalization of stereo sources. Although not directly related to the equalizer circuitry, all inputs also feature 80 Hz low-pass filters that can be used to eliminate subsonic noise that is outside the equalizers' range. All models except the MG82CX have from one to three AUX sends for convenient to processing and monitor systems. Master send controls are also provided, as are RETURN level controls for the AUX and STEREO busses. "CX" models have EFFECT send controls on all channels that adjust the level of the signal sent from the corresponding channel to the mixer's internal multi-effect system. The same signal can also be sent to external effect processors via the mixer's EFFECT SEND jack. The smallest models in the line up - the MG82CX and MG102C - have a single stereo bus (i.e. two mono buses). All other models additionally feature one or two stereo group buses and outputs that can be used for convenient channel grouping. Assign switches for the stereo and group buses are located next to each channel fader. While the MG82CX and MG102C feature rotary faders, channel and master level control on all other models is accomplished via reliable, high performance 60-millimeter linear faders that provide smooth, noise-free operation. When you have more than a few channels the direct visual indication of relative level settings can be an important advantage. Models with linear faders also feature illuminated channel ON switches that can be used to individually add or remove channels from the mix without having to change the positions of the channel faders. Accurate visual level monitoring can help you achieve maximum signal-to-noise ratio without distortion. The MG mixer's bright, easy-to-read multi-segment LED meters make it easy to control system levels for optimum overall performance.